Use JavaPodz with Keurig/K-Cup brewers! With the Perfect Pod Holster, you can use any universal-size coffee pod (including JavaPodz) to create delicious Keurig brewed coffee without using K-Cups! The Perfect Pod Holster allows you to use virtually any pod 55mm and greater in your Keurig Coffee Machine. It features a self tamping spring that extracts a better cup of coffee. Now you can buy less expensive pods and use them in your Keurig machine. You also can make your own custom coffee pods using the Perfect Pod Maker (sold separately) for the perfect cup of coffee. Compatible with most Keurig models using K-Cups. Not for use in Keurig model B100. 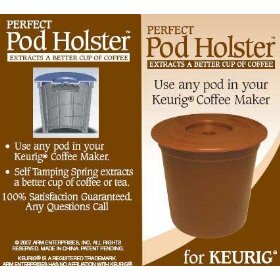 GO GREEN: Use a Pod Holster instead of K Cups filling up landfills!